Luxury Holidays Nepal family consists of the experienced staffs, certified guides and well-trained porters to accompany your journey. Our leaders are pleasant and well-principled people from various parts of the country. They speak fluent English, are licensed by Trekking and Tourism agencies, hold high altitude first aid certificate and are further well-trained and experienced. With their impressive sense of humor and in-depth knowledge of local place, you will never get bored in your whole trip. Our prime directive is to provide a first class adventure and holiday experience in the Himalayas that is sustainable and responsible. For more than a decade, we have expanded our services by providing new and unique destinations and itineraries that has been receiving positive feedbacks. We have properly insured all our staffs and paid them well, resulting in job satisfaction and wholehearted performances. Our experienced and enthusiastic members at office and field will make sure that you receive the best service and attention throughout your stay. 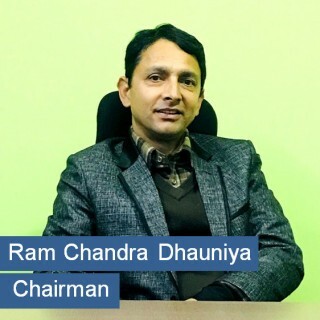 Entered into tourism field as a porter in 1992, Ram Chandra Dhauniya passed different hurdles working from Porter to guide and now resulted himself as a successful chairman to Luxury Holidays Nepal Pvt. Ltd. Born on 2nd September 1973 in Dhading, Nepal, Mr. Dhauniya was passionate in serving tourists when he saw tourist going to Ganesh Himal region passing through his hometown for the first time. After he accomplished his basic school, he moved to Kathmandu in search of University degree. He joined his university degree and simultaneously, he started working as a porter. Soon, he obtained ‘A’ grade Trekking guide license. He served thousands of tourists in his career as a mountain guide taking them to different regions of Nepal. Wherever he goes to the Himalayas, he loves to explore the new things and ponders how to open new trekking trail in order to offer a new flavor of trekking to the tourists. He loves mountain and the wilderness profoundly. He says’ I feel incomplete without witnessing mountains, hills, remote settlements and rhythmic waterfalls’. Mr. Dhauniya, having tremendous experience in Nepal tourism sector, has put his significant step in it as a tourism entrepreneur. He owns a profound knowledge about tourism in Nepal and always committed to cater a world class service to his clients. Academically, he has accomplished his Bachelor’s Degree in Travel and Tourism. He is humble, polite and hardworking. So far, he has visited different countries of Europe, Australia, Asia and America and has collected memorable experiences on how to promote tourism across the world. 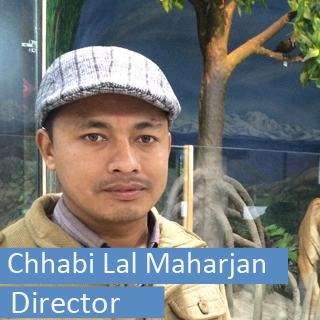 Chhabi Lal Maharjan is a tourism veteran with more than 15years of experience in the industry. He has completed his Bachelor and Master’s degree in Travel and Tourism management. A cheerful and helpful personality with the in-depth technical knowledge of the tourism sector, his consultancy is highly valuable. With the forces of the education and his vast experience, Chhabi Lal is a prominent personality that drives the steering of Nepalese tourism sector. He plays a vital role in helping shape the professional and qualitative service of the company. 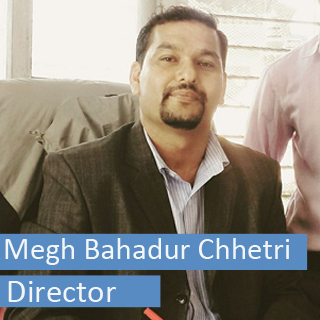 Mr. Chhetri began his travel industry career providing his service as a professional guide in the leading business travel companies at that time. He says, “Travel is not only my profession, but it’s also my passion. I enjoy encouraging my clients to try new and unique destinations.” Later his role as a senior trekking guide was an encouragement and role model to many of the young guides. Mr. Megh Bahadur Chhetri has also been honored as the best guide on several occasions. Over the years, he has gained a valuable insight to the corporate travel market and has built up an extensive network of contacts and relationships in the travel industry. He has decided to use his experience and knowledge for the upliftment of the tourism industry in Nepal. Shishir had collected his proficiency and deep insight of the industry through serving from root level to esteemed positions for the leading Trekking and Tourism agencies of the country. In his decade of experience, he built up a dream of making the industry more responsible and travelers friendly where the concerns of the travelers like safety, privacy, punctuality, quality & professional services are well-addressed. With the dream and dedication, he worked up to open a new Travel & Trekking Agencies in co-operation with the experienced veterans and energetic youths with similar visions which lead to the establishment of one of the most reputed agencies of this field. He had completed his Bachelors in Science with Physics major. He is the most prominent figure of Luxury Holidays Nepal. Having the inborn cheerful personality, good social and personal relationships was his natural thing. He had made his involvements and hosted various social activities such as blood donation, awareness program, volunteering program, serving orphanage, etc. With his hard work and dedication, he plans to serve the industry, country and the whole of humanity with his heart. Anish Thapa is an inquisitive person who received his engineering degrees from Pulchowk Campus, the most reputed Engineering College of the country. He has been using his intellect and spending time in research to enhance the technical aspects of the company. 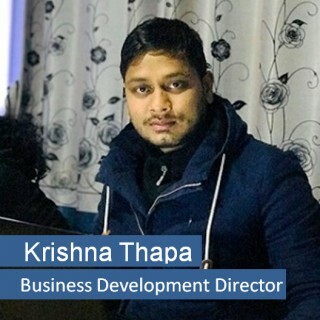 From the online marketing, website management to contents editing of the packages, Mr. Thapa works hard to offer you the best of the travel packages. Thapa is also engaged in planning, policy-making, supervision and implementation of the company policies and strategies. Besides, he also has a vast involvement in social activities, acting as a volunteer to the coordinator of various social functions and services. He intends to invest his dedication and sheer willpower for the upliftment of the travel industry. Resham K Shrestha is a dynamic youth from Gorkha, Nepal who currently lives in Raniban, Kathmandu. Completing his Bachelors in Industrial Engineering with flying colors, he instead decides to stay and serve Nepal unlike most of his friends who went abroad in pursuit of a better career. He believes that every human should work for the betterment of his locality and make this whole earth a beautiful place to live. With his keen interest to serve the motherland, he joined the team to create a professional trekking agency with the motive of quality service and zero compromise policy. Hence, Resham quickly got into action to bring the agency into operation and meet its objective. With the brilliant working style and co-operation from involved parties, a professional trekking agency was then finally brought into operation to provide quality service to the travelers. This young and energetic fellow handles all sorts of Business Development tasks. He is expert in developing every kind of trek and tour in different region of Nepal, Tibet and Bhutan. His business development has successfully satisfied the team and the clients so far. He always thinks of how to develop and organize a particular tour or trekking program in the most exciting, memorable and luxurious way. There is no such region of trekking in Nepal where Mr. Krishna Thapa has not been and explored. He is academically sound with M.Phil in English language and literature. So far, he has visited India, Bhutan, Tibet, Thailand, Australia and Canada for business conferences and seminars. Abid Zargar is the Director of our India office and the moving force behind our India operations. A seasoned professional in the field of travel and tourism, he brings over first-hand experience and knowledge of various popular as well as offbeat destinations in India. A passionate traveler from an early age – his vast travel around the region has given his extensive knowledge of not only India but also of the neighboring destinations like Nepal, Bhutan and Sri Lanka and has quite an understanding of the travel needs of the discerning traveler. A firm believer of impeccable service with an eye for perfection and the systematic approach ensures the smooth functioning of overall operations. Associated with Bhutan’s tourism industry for the last eight years, Ranjit Tamang’s relation with Tourism began as he joined the then Bhutanese infant Tourism industry as a guide. His bond with the industry grew over the years, and today he is capable to manage all Tours and Treks in Bhutan efficiently and holds the position of Operation in Charge of Bhutan for our company. Mr. Tamang is proficient with the Bhutanese tourism industry. Ranjit Tamang is originally from a traditional farming community Paro Bhutan. A keen mountain biker and hiker, he is constantly exploring and documenting the magic of Bhutan and keen to share the magical experiences. While traveling in Bhutan he is always there for your assistance. Leo Zhu is a residence of Lhasa, Tibet who has been engaged in Tourism of Tibet for 8 years. Over the year, he has been operating hundreds of tours and treks in the Tibet. He is very familiar with the histories, spirits, culture and Buddhism religion of the Tibetan. Moreover, he is a language master who speaks fluent Tibetan, English, Hindi and Chinese. Leo has been associated with Luxury Holidays for the past two years. In these years he is always there to assist the travelers and making sure that they have nothing to worry about while wandering in the Roof of the World. Leo has an important role to play for the happy faces of our travelers who visit the beautiful land of the Tibet. Ashish has been associated with Luxury Holidays Nepal as Marketing Director since 2017. He is a graduate in Social Work from Tribhuvan University, Kathmandu. At Luxury Holidays Nepal, his duty is to promote and market the products of Luxury Holidays Nepal in order to enlarge its business. He is keen to make research on the market where Luxury Holidays Nepal can have maximum profit. Under his direction on Marketing, Luxury Holidays Nepal has considerably connecting the world tourism to Luxury Holidays Nepal. Besides, he loves mountain and remote areas of the world. His passion in photography and music makes him distinctive from his counterparts. In the course of marketing and promotion, he has visited different parts of the world like India, Tibet, Bhutan, Asutria, Japan and many other parts of Europe. Roshan Chaulagain is a Nepali inborn who has been living in Jinzhou, Liaoning, China. He has been working as our representative in China since 2012. He is dedicated to helping Chinese travelers plan and manage their holidays. 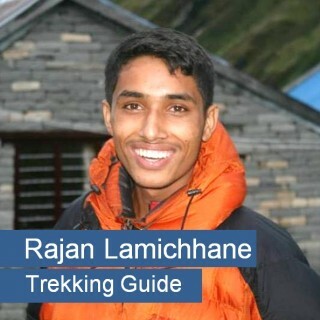 As an adventure enthusiast, Roshan loves travelling and exploring new places and cultures. He has already explored most of our destinations, collecting a first-hand experience of our packages. He can communicate in Chinese and is well-qualified to help you manage your trip. Moona serves for the esteemed post of Luxury Holidays Nepal’s representative based in the USA. She acts as the Trekking and Tour planner for US citizens. She is living in Irving, Texas; where you can meet her to plan your holiday. Being a friendly and charming person, people love to be around with Mona. She has demonstrated her excellent planning and management skills working with us for more than 3 years. Having spent a great deal of her time in Nepal, she admires the beauty of the country. Many of her clients have revisited Nepal several times. Trent Cox grew up in a very small town called Westbrook located in southeast Queensland, Australia. Growing up he always wanted to be a soldier and joined the Australian Military after graduating from High School where he served for 10 years. After leaving the military, he pursued work as a software developer and graphic designer. His interests include technology, fitness and travelling the world every chance I get. He has an active collaboration with Luxury Holidays Nepal as Representative in Australia. He handles every concerned affair of clients in Australia. Interested people can connect to him. He will give you all detailed information about the trip you have booked through Luxury Holidays Nepal. Passionate about nature and travel, Gauli is an Environmental Engineering graduate from Metropolia University of Applied Sciences in Helsinki, Finland. Being a light-hearted, friendly person, travelers find it easy to plan their trip with him. Bibesh is very much concerned about the quality of services and safety of travelers. He thinks that not just as a job, but as a man, we should be considerate, reliable and courageous. He takes care of every minor detail and ensures that traveler’s concerns are properly addressed, to assure that our guest leaves with happy faces. Sangip has been part of Luxury Holidays Team after completing his treks in different regions of Nepal. As an enthusiastic traveler, he has travelled to various parts of Nepal. He is now well acquainted with the Everest, Annapurna, Langtang and Mustang regions of Nepal. Passionate about nature and travel, Khadka loves outdoor adventures. Being our representative, his favorite task is to help travel lovers arrive in Nepal to embark their long-anticipated adventure. He keeps knowledge of English and Japanese. Sangip is kind-hearted and friendly by nature, therefore, travelers find it easy to plan their trip with him. With his burning passion on the IT, you can see Saksham Khatiwoda with his hands on the keyboard most of the time. Keeping himself up to date with the fastest growing technology, Saksham is a key member of our group. If you ever experience a digital problem, he is there at your serve. In this age of online interactions, Saksham and his team are providing a vital service to our organization. They have a lot of work to do from updating our database to presenting a simple, clear and attractive interface to our clients. The IT operators are the guys responsible to keep our online services running. It is the routine of Rajendra to check the transactions and keep a record of the financial aspects of the work. He is busy with adding and subtracting the bills and calculating profit and loss. Rajendra Karki doesn’t sleep until debit equals credit in the balance sheet. As an accountant, it is his responsibility to properly record and preserve the financial data. Your payment record and expense history is always safe with us. Mr. Karki provides the accountant service to Luxury Holidays Nepal. Smiriti is a Management Graduate with an experience in Client support. She is gentle & polite and you can talk to her at ease. She is always there to ensure client satisfaction and answer queries of the travelers. A social and friendly person, she is good at connecting with people and understanding them. Her professional skills are a merit to Luxury Holidays Nepal. You can see Kiran most of the time standing outside the airport terminal to greet you upon your arrival. He is a hard working person originally from Gorkha. Khadka is assigned the duty to roll around the airport, from receiving and dropping clients at the airport. Like his driving, Kiran is a pleasant person. He is a well-trained professional driver who is also aware of the importance of sustainable tourism. During his 8 years of service, we have nothing to complain of him. Driving is his passion. He is enthusiastic about life and loves meeting new people. Sajina has been associated with Luxury Holidays Nepal as Corresponding Personnel since 2015. At Luxury Holidays Nepal, her duty is to look over reservations, provide trip information to clients, ensure itineraries are followed up and to listen and solve clients’ problems. She skillfully completes all her task which also includes managing fleet service and hotel reservations. Kushal is assigned with the job of issuing the ticket for all the domestic flights and international flights. He keeps records of the flight dates and details of all our customers and ensures that everything is maintained properly. He is there to make sure that you get the best possible flight at the minimum fare on the available date. He also works to ensure the proper organization and operation of our fleet. Due to our volume of air tickets, we have been able to get a special rate from the airlines. We share that privilege to our valued customers also so that we could provide the plane tickets at a further lower price and boost our customer relations. Kushal is always there to ensure that you travel comfortably without anything to worry about. Prabal excels as a trekking guide in major destinations of Nepal such as Annapurna, Everest, Langtang and Mustang. Starting out as a porter, he is today a well-established trekking guide of Nepal. He speaks good English and holds ‘Trekking Guide’ license from the Ministry of Tourism in Nepal and is also certified for High Altitude First Aid Treatment. Prabal is originally from Gorkha, the land of brave Gurkhas. The passion and curiosity of travelling to new places made him join the trekking industry. Besides pursuing his degree in Business Administration, he has been working with Luxury Holidays Nepal for past 3 years. On the trek, he’s incredibly fit and composed, but also relaxed and casual. He accompanies you along the trail, going at your pace without a hint of impatience, leaving plenty of time for you to immerse in the beauty of Himalayas. Young and energetic Deepak takes pride in introducing people to the amazing culture and landscapes of the Himalayan country. He speaks fluent English and holds licenses from Tourism Ministry and had undergone High Altitude First Aid Training. Without any hesitation, he can provide good guidance and professional service every moment throughout your entire journey in Nepal. All this year, Shrestha has been extensively trekking around the major shrines of the Himalayas like the Everest, Annapurna Circuit and Langtang regions. Besides being a trekking guide, he is also successfully running mountain biking campaign as a leader. His excitement for adventure is infectious and spreads to all who have had the pleasure of sharing a trip with him. Krishna Khadka is one of the most experienced trekking guides of Luxury Holidays Nepal. He has been guiding trekkers all over Nepal for last 15 years and serving as our main guide for past 2 years. He provides the most professionalism, service leading him to guide the trekking groups with great care for their safety and concerns. No doubt, he is also licensed from Ministry of Tourism of Nepal and also holds a High Altitude First Aid Certificate. Starting out as a porter, Krishna has worked his way up and is now one of the most respected trekking guides within LHN. He maintains a strong focus on our travelers’ satisfaction. We have no hesitation in saying he can provide good guidance every moment throughout your entire travel experience in Nepal. Niraj Dangal is a notable trekking guide with vast numbers of training received. As well, he is a licensed guide and has proven his skills capability, throughout his association with the company. A hospitable, light-hearted, reliable person, he has our highest regard for his work ethics and bona fide character. 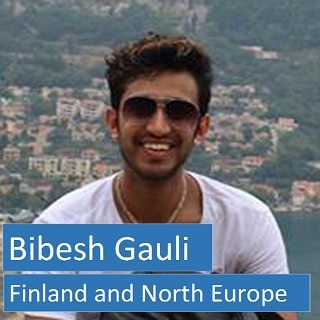 Niraj is keenly interested in tourism and loves working in this field. He is very familiar with the trekking at Annapurna, Everest, Manaslu and Langtang regions of Nepal. During his leisure time, Dangal is often seen hanging out with his friends and exploring. His dedication to duty and a fine sense of humor sets him apart. He has the caliber of becoming a top-tier guide of Nepal. Mr. Ramchandra Baniya has been in association with the tourism industry for over 12 years. All these years he has been extensively trekking around the major shrines of the Himalayas like the Everest, Annapurna Circuit and Langtang regions. His passion for travelling and affection for the splendor of nature has driven him into making into his career. Ramchandra attempts to make every trip a recreation moment and strives to promote trekking and tourism. 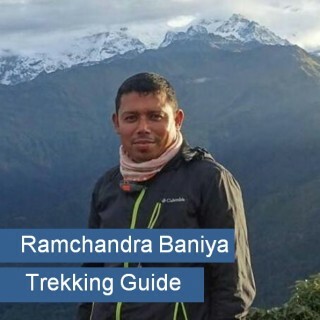 With his well-maintained fitness and stamina, Baniya will assist you throughout the trek. Like all our guides, he is also licensed from Ministry of Tourism of Nepal and also holds a High Altitude First Aid Certificate. Rajan originally hails from Gorkha, the land of brave Gurkhas. The passion for his travelling and curiosity about knowing new places made him join trekking industry. Besides pursuing his degree in the Business study he has been working with Luxury Holidays Nepal for past 2 years. Swami Basu Samarpan is a mystical, religious tour guide. He has been engaged in the tourism sector for several years now and is familiar with every part of Nepal and its local cultures, environment, vegetation & wildlife. In addition, he has also received training in the Tourist Guide Training Course from Nepal Academy of Tourism & Hotel Management. You will feel blissful to receive the valuable information and insights of the cultural sites in the city tour from the vibrant yogi, Swami Basu Samarpan. Swami Basu is also an expert yogi who will guide you through the serene path of the yoga and meditation courses. He quotes, 'Meditation is the highest luxury.' and encourages us to experience it. Do not miss your chance to get acquaintance with the yogis while you are in Nepal. Anjila is a professional tour guide and one of the reputed guides of the company. She is a delightful person and our tour groups are happy to receive her service. She keeps you well informed through the tour and is always available to answer your curiosities on tour. Anjila had participated in tourist guide training at NATHM and holds tour guide license from the Department of Tourism. Through her years of service, she is well-acquainted with all of the cities and districts in Nepal. She is knowledgeable, charismatic person with good communication and organization skill, so is a perfect tour guide. Pranav is an experienced tour guide providing his valuable services for more than four years. He has been operating tours with Luxury Holidays Nepal since 2015. A charming person with inborn leadership qualities, our tour groups are happy to receive his service. He keeps you well informed through the tour and is always available to answer your curiosities on tour. Through his years of service, he is familiar to nearly all of the cities and districts in Nepal and also to major spots on Tibet and Bhutan. Besides completing his visit to the tourist spots of these countries, he has also travelled to Russia, India, Kailash, Thailand, Singapore, Malaysia and China. With his deep insights on things and humorous nature, we are sure Pranav will keep you occupied throughout the tour. Stepping into Tourism in 2001, Bikas Vandari began his career as a porter. He worked as a porter for more than 5 years. With his tremendous experience in tourism, he turned himself as a successful trekking and climbing guide in 2006. He has successfully accomplished extensive training of climbing and guiding organized by Government of Nepal. He obtained ‘A’ Grade license for climbing and guiding. Mr. Bikas Vandari has successfully operated numerous trekking and climbing in different regions of Nepal. Clients are found always happy to receive his leadership in the mountain either for trekking or climbing. He loves to take the clients to the remote parts of the Himalayas. So far, he has made successful climbing of Lobuche Peak, Island Peak, Mera Peak, Chulu East and Pisang Peak several times. Luxury Holidays Nepal Pvt. Ltd fully trusts on his skillful leadership. Originally from Gorkha, Mr. Ram Prasad Lamichhane is a role model to other trekking guides in Nepal. His world class service and astounding leadership makes him always an accomplished mountain guide. Many beginners learn so many things from him. He is an ‘A’ Grade licensed trekking guide who has been associated with Luxury Holidays Nepal since 2006. He is well trained with first aid, climate, mountains, local culture and hospitality. His keen enthusiasm to explore the Himalayas and the culture make the clients pleased. He has carried out numerous treks to different regions like Everest, Langtang, Mustang and Annapurna. Among these regions, his best choice is Everest. He is friendly, sociable, and funny. He loves to make his clients laugh all the way.